Though it might be hard to believe, in no time at all, cold weather will be moving into the Nashville area and—as always—overstaying its welcome. During this cold time, having a quality roof over your head is essential. Given the harsh weather of winter—cold rain and snow and ice—it only follows that during this time that both residential and commercial roofs are more susceptible to experiencing problems. As Nashville’s go-to roofing contractors, specializing in roof repair, replacement, and maintenance, we strive to provide our clients with all the information and roofing services they need to stay safe, warm, and happy. To help with this mission, in today’s blog we will be looking at some of the ways you can prepare your roof for winter. Read on to learn more, and contact Tim Leeper Roofing for all of your roofing needs. The first step to winterizing your roof begins with a thorough cleaning and inspection. As we’ve mentioned before in previous blogs—like in the post on roof maintenance—routine inspections and maintenance are a surefire way to keep your roof sound and in optimal condition. Starting from the top and working your way down, use a push broom or leaf blower to clean off any leaves, limbs, twigs, and debris. While you are cleaning, inspect your roof for any signs of damage. This may include loose shingle granules, missing shingles, and damaged flashings. For a more detailed look at what to look for while performing an inspection, check out this blog on the subject. Also, be sure to remove all the debris and leaves from gutters. This will allow for proper flow and help prevent any ice build-ups. If while inspecting, you spot any areas of concern, don’t let them go unresolved. 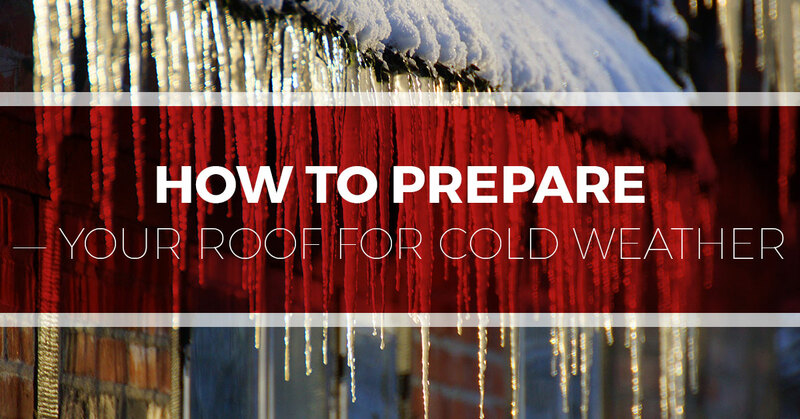 Winter tends to magnify small roof problems, turning them into big ordeals. Rest assured that most minor roof repairs are typically inexpensive and can be done with little experience. However, if you feel you don’t have the necessary knowledge or experience to perform a quality repair, reach out to your trusted roofing contractors—we’d be glad to help. After cleaning the outside of your roof, it’s time to head to the attic. Once there, you will want to feel along the walls and ceiling that adjoin your roof. If you notice any signs of a leak—wet surfaces, warped wood, mold, mildew, etc.—you will want to immediately contact a professional roofer. Leaks are typically not best resolved through DIY roof work. Consulting with an expert can ensure that the job gets done right the first time, which in the long run can save you both money and time. After looking for leaks, you will also want to consider your insulation. If your building or home is old and has a flat roof it is likely that you do not have proper insulation. Without a layer of insulation between the inside of your home and the roof that is being exposed to all the cold elements, your home will be colder and more susceptible to other forms of damage. One particular threat that can result from poor insulation is ice dams. These occur when heat from inside the home escapes through the roof—because of poor insulation—melts the snow, which then runs down, collects, and freezes in the winter cold. This can impede the flow of melting snow or water as well as add potentially damaging weight to your roof. Though these aren’t an everyday winter occurrence here in Nashville, they are possible and hopefully inspire you to make sure your attics are sufficiently insulated. Something that many people don’t always consider when heating their home in the fall and winter is that their wall actually holds temperature—meaning, once the walls are already cold, it requires a significant amount of heat from the inside to warm them. Not only does this mean higher heating bills, but it also can attract moisture and mold to your roof. This occurrence is often called the “dew point”, and once in your attic, it can be hard to get out. To keep this from happening to your home, don’t wait until it gets bitterly cold to turn your heat on. Keep your home at a constant warm temperature, which will prevent a large variance in wall temperature and, therefore, decrease the likelihood of the dew-point effect. Even though the winters in Nashville aren’t as extreme as up north, the chill of the winter does make roofing material more brittle and more susceptible to damage. If you find that you could use a hand with your roof winterizing, don’t hesitate to contact Tim Leeper Roofing. We can provide a roof inspection as well as any necessary roof maintenance, repairs, or replacements. Contact us today for more information or for your speedy fast quote!